The Hydra IIC is a fully automated turnkey analyzer that measures mercury in solid and semi-solid sample matrices directly without any acid digestion (sample preparation). The system employs the technique of sample combustion (thermal decomposition), mercury concentration via gold amalgamation and detection by cold vapor atomic absorption. 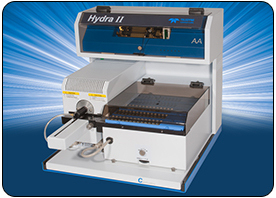 The biggest advantage of the Hydra IIC is that no sample prepartion is required before analysis. And, because no sample prep is required; the cost and hassle of dealing with waste disposal is avoided.